Wolves continually disperse southward in Wyoming following the drainages like the Greys River and the flanks of the Wyoming Range and the Salt River Range. Most, but not all, run into lots of livestock, especially sheep as they get further south, and the wolves disappear. Here, from last summer, is a band of sheep getting bedded down, at the very southern end of the Salt River Range. 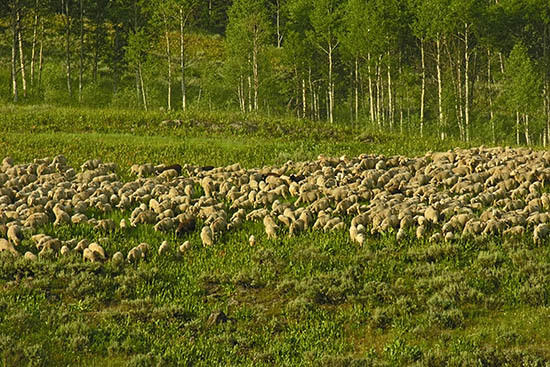 The area is full of aspen, beaver ponds, elk, deer and moose, so the wolves are not short of wild prey, but there are so many sheep! Just look at how this “Wildlife” habitat is over-run by these sheep! What a waste! Even if you think sheep belong in a “Wildlife Habitat”, who wants to walk through tons of sheep crap and damaged foliage! Man continues to screw up the balance of our ecosystem. Bring back the wolves!! Ranchers, buy your own land for your “domesticated” animals.